He’ll tell you this himself, but from 2010 to 2016, Taran Killam was living the dream. As a key cast member on Saturday Night Live, he performed an endless number of memorable skits and shorts, while working alongside his heroes and role models on a weekly basis. Even after his abrupt exit from the show last summer, it shouldn’t be a surprise to hear that Killam is just as bright and optimistic about the future as ever: he’s currently starring on broadway and wrapping up his directorial debut and passion project, which will hit theaters later this year. After all, this is a guy who’s been working in show business since he was a teenager: I first knew him from a bit part in Nickelodeon’s The Amanda Show, while others may recognize him from the Disney Channel original film Stuck In The Suburbs, or a short run on MADTV that preceded his more visible run on SNL. Right now, the 35-year-old is finishing up his Broadway debut, a three-month run as King George on a show you may have heard of called Hamilton (his final night is April 13), before focusing solely on finishing up and releasing Why We’re Killing Gunther. In his debut as a director, he also plays a starring role (alongside Arnold Schwarzenegger, among others). After seven years in the big apple—a relocation that came along with the gig on SNL—Killam, along with his wife, actress Cobie Smulders (of How I Met your Mother fame), and their two children are also planning on a late-summer move back to California, from where the comedic actor hails. Before all of that, though, I had the chance to hang out with the very funny actor, writer, and director at Budin, in Greenpoint. Killam was a joy to talk with, touching on everything from the stuff we’re mutually geeking out on (superhero movies, Get Out, and Star Wars), to his experience with Trump, the Los Angeles Rams, and now his own post-SNL career. Brooklyn Magazine: I know you’re a big fan of nerd stuff, like me. Did you see the new Spider-Man trailer? Taran Killam: It’s so good, isn’t it? Yeah, it looks so cool. I’ve loved everything Michael Keaton has done since Birdman. He’s the best. The original Batman, that movie made me want to be in movies. The line in it where he goes “I’m nothing without the suit.” “If you’re nothing without this suit, then you shouldn’t have it.” That’s so good. It’s such a good moment, already, in the trailer. And Justice League… just blowing it. I just think they’re just blowing it, because, like… there is no reveal that they’re saving, because at the end of their movie [Last year’s Batman v Superman: The Dawn of Justice], they reveal it. They show the rocks, and [Superman] is still alive. They’ve already revealed that he’s still alive. Exactly. I don’t know who they think they’re fooling. People are saying the movie is so far off, but, still—what this trailer should have done is: [MAKES KABOOM SOUND], and you see him land, and you don’t show him, but you show the fist, or you show whatever. And then in the next one you can do a little bit more if you want. And you know they’re thinking about it so much, like, damage control, after last year’s fiascos. Oh my gosh. Totally. Yeah, I know. I’m curious to see what’ll happen with The Batman, and all that stuff too. A few weeks ago I spoke with Alex Karpovsky from Girls, and he did a lot of scenes with Adam Driver, so I was kind of subconsciously hoping something related to Star Wars would slip. But I doubt he knows either, with all these NDAs and stuff. Lena [Dunham] was hosting (SNL) when it was first announced that he was in [the new Star Wars films], and I remember her saying [in a pretty solid Dunham impression for such impromptu notice] ‘I asked him, and he won’t tell me anything. And I said, well, what’s your character’s name?’ She said she asked him “Are you a [sic]wickie?”… and that was disappointing to hear. And then she’s like, “He said his name was, like, Ashcore Rockney,” And I was like, that is not the name [LAUGHS]. It’s pretty close—Kylo Ren. Yeah. Whenever I’m reading or watching the news and see Reince Priebus’s name, I always think how Star Wars-y that name is. [LAUGHS] He is a trade federation senator for sure. So, switching gears a little bit, but I’m 24, so when I was growing up and watching Nickelodeon and first getting into comedy shows, one of the first ones I watched was The Amanda Show. That was the first thing I saw you in, of course. I was wondering if people ask about that often? They do! They still do. That, at the stage door coming out, a lot of people love Moody’s Point [The show-within-the-show soap opera spoof in which he appeared] and ask about Moody’s dad’s toe, because there was no resolution. And then I did a Disney Channel movie called Stuck In The Suburbs, which people love, too. I mean, Nickelodeon and Disney replay stuff so much that things never really go away. So, as much of it as there are people who are 24 and up and down, there’s still young kids discovering it for the first time, too. You’re the first SNL cast member I’ve ever interviewed, so I could ask you so many questions. Bring it on. I could talk about it for days. I’m sure you’ve talked about this before, but what’s your favorite memory from six years on the show? Gosh. That’s so hard. I mean, there’s nothing like hearing that you’ve been hired. There’s just no bigger rush of adrenaline, victory, celebratory moments in the whole process. I don’t think there can be. Did you listen to Jenny Slate’s WTF interview, with Marc Maron? She does such a great job of explaining that moment. She gets emotional a little bit in explaining it, breaks down, and listening to that I was sobbing with her; because it is… it’s this childhood dream, or a long term dream, I think, for most people who did it. So, that is the ultimate feeling of exaltation for sure. In terms of individual experiences, there’s just so many to count. Because you’re really just on this wild roller coaster ride of the highest highs, and working with your heroes, and getting to do sketches with not just people like Jim Carrey, and Drake, and everybody across the spectrum, but the people you work with. I think the greatest performers I’ve ever stood side-by-side with are Kristen [Wiig], and Bill [Hader], and Vanessa [Bayer], and Bobby [Moynihan], and Kate [McKinnon], and Kenan. These are some of the most immensely talented and kind people I’ve ever met in my life. In terms of ‘the best experience’ it gets divided into these categories. Probably the things that matter the most are the things that wouldn’t be too exciting to hear, but hanging out in the writing office, and laughing about some dumb bit that will never see the light of day. Those are probably the most joyful moments I’ve had on the show. Speaking of the writers office, that Robyn “Call Your Girlfriend” video that you made is legendary. Yeah! Well, exactly. That was a great way to encapsulate that energy of being loopy, and being exhausted, being full of doubt, but also finding the dumbest things to be hilarious. Robyn was the guest that week, and I just kept playing the music video for people because I just loved that video, and Sarah Schneider, who’s now one of the head writers, she was like, “You should just film that in your office,” and I accepted that dare. And people love it! It’s so funny. I love Bobby flashing the light. Exactly. Exactly. And Zach [Kanin], who was my office mate, sitting at his computer… I feel like he’s the real star of that video. Just blocking everything out. Have you and Kenan ever talked about how you both started on Nickelodeon? We did. Our common denominator was Dan Schneider, who created All That, he created The Amanda Show, and Kenan and Kel, and has been very good to us, and remains a good friend of both of ours. So, we definitely shared that bond. Kenan and I were repped by the same manager for a long time, and that’s how MadTV happened—MadTV called seeing if Kenan wanted to audition, and the manager said “I don’t think it’s right for Kenan right now, but you should see this kid Taran.” Kenan and I are linked in a bunch of odd ways. Were you on MadTV at the same time as Jordan Peele? Because I was thinking of you guys in kind of the same realm, in terms of comedy people making their directorial debuts. And Get Out was so amazing, and I think your movie, Why We’re Killing Gunther, sounds really great too. I just watched Brother Nature, which you wrote, the other day, and it feels like directing would be the next logical step. It’s cool that you guys are going down that same path. We’ve known each other for a long time, because I think once he got hired I still had friends and hung out with people that worked on MadTV. So we met back then, and would run into each other at comedy theaters, like Groundlings, or UCB. In terms of brilliant improv performers, there’s nobody better than Jordan, so I’ve had that respect for him for a long time, and I think he absolutely killed it. I think Get Out is the best movie I’ve seen in years, probably. We went and we saw Get Out, and we saw Logan the next week. Both amazing. Without spoiling anything, Logan is very violent; it’s a rated R movie. So I could see how some people might not like it. I loved it. But Get Out… that’s like, it’s so good that I feel like if you don’t like Get Out, then you and I will have nothing in common [LAUGHS]. We’re just very different people then, because it’s funny, it’s scary, it’s intelligent, and the plot itself is so airtight. I was blown away with the job that he did. And then with your film, I’m sure you had a blast with that. How great was directing Arnold Schwarzenegger? It was so fun. It was a dream come true. I grew up watching his movies. He was like, the biggest movie star of all time. I had my Terminator 2 action figure, and I loved Commando; Commando was sort of my favorite of the early 80s—of the original Terminator/Commando/Predator, Commando was my movie. SNL is a job full of these surreal moments where you’re meeting these people you never thought you would, and you’re in this environment you’ve always dreamed you’d be, but somehow working with Arnold surpassed all that. Kind of that larger than life figure. Yeah, and particularly what our movie is—I mean, I love action movies, and have my whole life, but I wanted to do a mockumentary in the style of a Christopher Guest film about hitmen. Our premise is this sort of motley group of upcomers are trying to establish themselves in the industry by killing the most famous hitman of all time, Gunther. And we got Arnold Schwarzenegger to be Gunther, which is insane. That movie has a fun cast. Bobby is in it too, right? Bobby’s in it too, yeah. So it’s me, and Bobby, and Hannah Simone from New Girl, and Allison Tolman from Fargo. And then a few friends that I’ve worked with from Groundlings. Paul Brittain, who was on SNL was with us. And so the core group was really great, and I had a close relationship with most people, and then we were able to really have fun with Arnold. Arnold is the funniest I think he’s ever been in anything. Truly. He steals the whole movie, and rightfully so. We sort of build up to that, but he was so game, and came with like 2-3 ad-libs for every joke we had in the script of his own. It was a true joy. So with this film, your post-SNL career is really just getting started. There are a lot of different paths that comedic actors take as they move forward, and of course you were even in 12 Years A Slave, where you showed you’re not afraid to do a drama here and there. I was wondering if there’s anyone who you might see yourself following their path? With the acting and directing, I was thinking Ben Stiller a little bit. Certainly. He’s at the top of the list, because I mean, this is a guy who was in Empire of the Sun, and this is a guy who directed Reality Bites, but he’s also the lead of Meet the Parents. I really look to him as a role model. Jon Favreau is another one. I feel that people are doing it more too—the way we consume movies, and stories, and media in general is that it’s a lot more user-friendly with the technology. Seth Rogen and Evan Goldberg too—what those guys do I really love, because they’ll direct This Is The End, but then they’re also executive producing Preacher, which is a really cool show, very different. Joseph Gordon-Levitt is also directing; James Franco, what he does. When did you first start realizing that you wanted to direct a feature? It happened very organically with the script. It was a script I started writing five years ago, and finished three or four years ago. In trying to get it made, I was pitching and re-pitching, and reaching out to director friends, and all of them were very supportive and helpful and said ‘Yeah, we’d love to do it if this gets figured out. But it just got to the point that nobody knew it as well as I did, and because it was something I wrote, and something I was going to star in, those are already two big bites, so I sort of thought “why not make the third?” At least that way, I would know that I’ll take full responsibility for its successes or failures, even though to make a movie requires the incredible creativity and efforts of hundreds of people. I had so much help and so much support, and protection, but this movie is very much of me. Have you embedded yourself in the comedy scene in NYC at all in your time here? I’m not as much, because I came from Groundlings, and it was almost exclusively performed there. I did a few shows at UCB on Franklin, but I was almost entirely based out of The Groundlings Theater, and my connections out there. People have been very gracious—the UCB theater here has had be come and do a couple AssssCats. Chris Gethard was always really nice to me, and welcoming. A lot of cast and writers were always going and doing shows in Brooklyn, at The Knitting Factory. Michael Che was putting shows together, and Sasheer would put together her own show at… was it Town Hall? Was that what it was called? Union Hall. That was it. They actually just had a big fire the other day, unfortunately. I don’t think anyone got hurt, but just a bad accident. Yeah, that’s a bummer. There were some fun shows that I did there. I’ve also done Kevin Corrigan’s talk show a couple times. He did one there. I’ll go see friends, I’ll see that show Sweet, Vanessa will perform there, and UCB East. I try to go and support, but when I was out here my family was still in LA for the first four years, so all my down time was back in LA. Speaking of LA, I know you’re a big Rams fan. Were you a Rams fan before they moved to LA? I wasn’t. It was the first and only live NFL game I ever went to as a child. My parents took me when I was, like, a year old to the LA Coliseum. Once I was in college, I started playing a lot of fantasy football, became a big NFL fan, and just promised myself that the next team to come to LA, I was going to go all in on, and that’s the Rams. Good way to follow through, right? That’s fun. Eventually! I like the moves they’re making. Big swings. It’s exciting to be there from the ground floor. Football in LA! Before we wrap, we’ve gotta talk about Hamilton a little bit. You started in January, so what have your first few months on Broadway been like? I’ve never done one thing. I’ve never performed one piece this many times; I actually had to call in sick on Sunday, which is such a bummer because it was going to be exactly 100 performances, so now I’ll fall short by one—it’ll be 99. Which is a weird, unimportant stat that only matters to me. 99 is a nice number. It’s fun. Exactly. I like symmetry of it. A palindrome, right? A nice palindrome. But I’ve never done anything that many number of times. So, the stamina and the exploration of something where you can literally search… some of the people I’m performing with have done the show for almost two years now, and so getting to own something that much, and really explore each moment, each detail, each word, each lyric, each note, has been a real treat, in terms of the stamina that requires, and the openness of not getting stuck in something, and not getting repetitive. For me, that’s been a challenge. I would say it took six weeks before I felt comfortable on stage, and now in these last two weeks I’m really trying to milk it and own it, make the most of it and try to find new moments while still honoring the source material. How does the daily grind of being in the biggest musical in the world compare to the daily grind of SNL? Nothing requires as much of you as SNL. If a person can survive SNL for any number of years, you can basically do anything else, in terms of time requirement. It’s very emotional, even in my role—which is the comedic relief—you feel the emotion of the audience. You feel how much this show means to people, and how much time, effort, and money people have put into the show to get here to experience this. It’s very potent, and you really feel that up on stage. It’s incredibly rewarding, but it’s also draining. It connects you to the play, to this masterpiece that Lin has written, and requires a significant amount of you, even for me, which is doing a smaller part in the show. You started after the Mike Pence incident, right? Does anybody still talk about that? I mean, for a show that was already the biggest thing in the world, that somehow found a way to make even bigger news. I think it was really well handled, and I’m very impressed by how the cast handled it. I think what I’ve learned from the cast is that a lot of the negativity was coming from the audience, and I think it was important for the cast that Mike Pence know that they were glad he came, and glad they had that opportunity to perform for him and to communicate with him, and that all are welcome at Hamilton. It’s not a show for any one type of person. I think you see that in the story, in the way that they’ve cast the show, and the people who connect to it and are affected by it. So yeah, I definitely know that people like things that are salacious and scandalous, and you watch the videos and you hear the boos, but I think that’s raw emotion coming from the people that are sharing the space, and I think if you watch what was said by the cast and by the show, and the way that they presented themselves, that it was intended to be an exchange of ideas. Even that aftermath, when Pence himself was interviewed about it on TV, he wasn’t as mad as the ~president~ was. Yeah, well, the president is a moron. Yeah. Man, I just remembered that you were on last year when he hosted—I don’t even wanna ask about that. He was… everything you see. What you see is what you get with him, really. I mean, there was no big reveal. He struggled to read at the table read, which did not give many of us great confidence. Didn’t get the jokes, really. He’s just a man who seems to be powered by bluster. I digress; you’d known Lin Manuel-Miranda from How I Met Your Mother, and now Hamilton. What’s something interesting about him that everyone else might not know? His kindness overwhelms me. He invited me and my family to an early screening of Moana, and he’s a family man himself, and so I think there’s a lot of mutual respect in terms of balancing family with a healthy career. But he’s just a kind man, and he’s a fan of everything. He’s just a genuine fan of life, and people, and all things creative. So what else are you working on for the future? You’re almost done with Hamilton, Gunther is coming up, anything else? Right now, it’s more about finishing things before finding what that next thing is. So, Gunther will take up the rest of the year in terms of finishing it and putting it out in the world, and then this move back to California, to figure out what the next move will be. And then the Rams season. And then Rams. Just in time for the Rams. What? 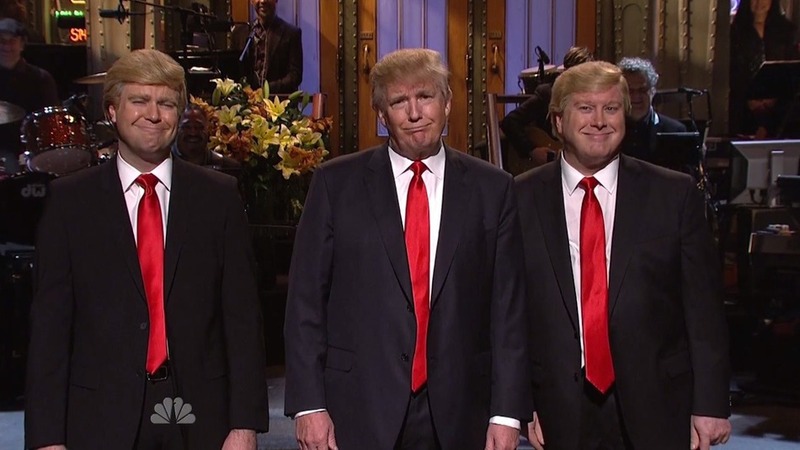 You mean the libs at SNL were not excited that Trump was going to be on and that he didnt get their leftist jokes? SHOCKING!